Chemical action to prevent limescale with pleasant fragrance. Ideal in combination with EVO SPONGE (red for toilet, yellow for sanitary ware) and the new ZEUS cloth. Specific polishing action for steel. Ideal in combination with MICRO INOX ACTIVE microfibre cloth specific for steel. Cleaning action with zero residual specific for glass and glossy surfaces. 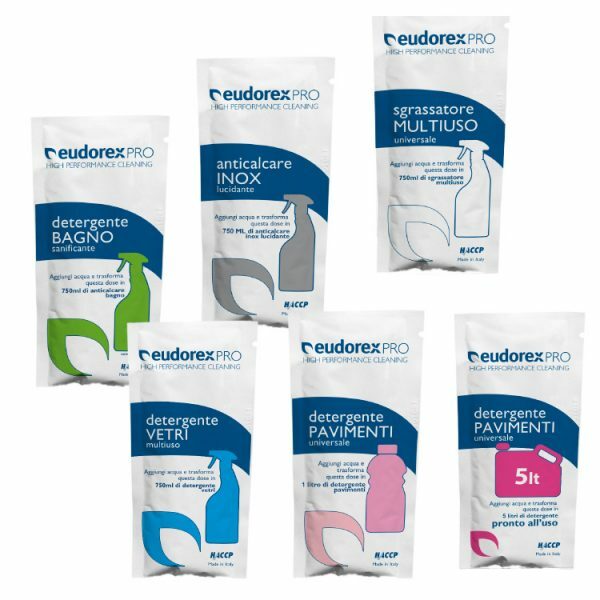 Excellent in combination with the KIT VETRO PRO or MICROBLU VETRI system. Quick degreasing action, suitable for every surface. Can be used together with an EVO + MICROFIBER CLOTH SPONGE (ZEUS or MICROTEX) FLOORS 25 ml dose for 1 L. cod. 273 Ready to use without rearing. Ideal for classic floor washing systems with mop and bucket. Ready to use without rinsing. Can be used with the Q5 MANICO SPRAY and ZEUS MOP system. 1 sachet = 10 handle refills = 1000 square meters of average autonomy.